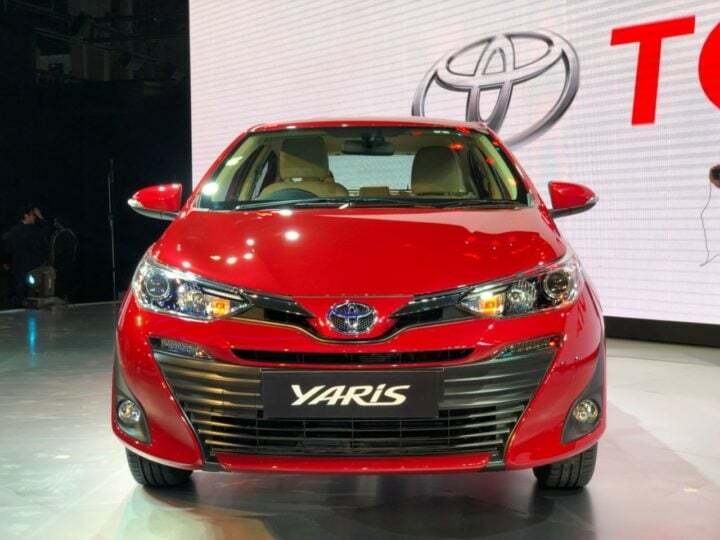 The 2018 Toyota Yaris was showcased at the 2018 Auto Expo. In a report filed by Autocar India, the media agency claims that Toyota might not launch a diesel version of the Yaris at all. Toyota Kirloskar Ltd has been famous for watching and calculating keenly before they launch their products. These in-house practices take a lot of time and often result in products being delayed. But when Toyota launches a new product, no matter how big or small or ugly, it just sells. By hook or by crook, Toyota successfully sells each product it introduces and the same can be seen in the markets all over South East Asia. Toyota’s upcoming new car in India is the Yaris, which was showcased at the 2018 Auto Expo, will be launching in the coming months in India. Want to know more about the upcoming sedan, read along. 2018 Toyota Yaris – No Diesel? A rumour has been floating around in the industry about the upcoming 2018 Toyota Yaris might not launch with a diesel engine. Globally, the Yaris is only offered with a petrol engine but, unlike India, they are petrol centric markets. India being the only diesel-centric market amongst its neighbours, might not receive a diesel option on the upcoming Toyota Yaris. The reason behind the speculation is that the only small diesel engine Toyota has in India is the 1.4-litre unit that does its duty in the Etios twins. The 1.4-litre diesel engine is not BS-VI compliant hence it will be dropped even from the Etios and Corolla range in 2020. Since fitting the 1.4-litre diesel unit will require a whole lot of research and development, Toyota might just skip the entire process and not provide a diesel option at all. Moreover, Toyota officials claim that the share of diesel vehicles sold in the segment has been decreasing over the years and even the figures that stand today, investing into a diesel variant of the upcoming Yaris does not make sense. Toyota is more likely to introduce a Hybrid version of the Yaris but that too might be a couple of years away. The final specifications of the upcoming 2018 Toyota Yaris will be available closer to the launch. As for now, only the 1.5-litre petrol engine is confirmed to power the upcoming sedan. The engine churns out 108 hp of max power and will be offered as BS-VI ready upon launch. The engine will be offered with a six-speed manual transmission while the top variant will get an option of a CVT transmission as well. The upcoming 2018 Toyota Yaris will carry several segments first features like front parking sensors, power adjustable driver seat, roof-mounted rear aircon blower amongst others. These features plus Toyota’s trust factor will be the main selling points for the upcoming sedan. Upon launch, the 2018 Toyota Yaris will compete with the likes of Honda City, Maruti Suzuki Ciaz and Hyundai Verna. Expected to be priced between INR 8.4 lakh to INR 13.5 lakh, the base variant undercuts the Honda City but the top variants might be costlier than its competition. Stay tuned for more info on upcoming Toyota cars.